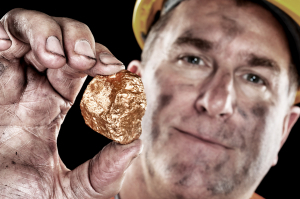 Gold stocks come in two flavors: traditional mining companies and streaming companies. The former group includes the likes of Hecla Mining (NYSE: HL) and Barrick Gold (NYSE: ABX). They conjure up images you might expect from a mining operation -- buying vast pieces of land, moving many metric tons of earth around with heavy machinery, and extracting precious metals by the ounce. It's expensive, heavily regulated, at the mercy of volatile prices, and risky. The latter group includes the likes of Royal Gold (NASDAQ: RGLD) and Wheaton Precious Metals (NYSE: WPM). They operate a bit differently from their mining peers because they don't move so much as a bucket of dirt. Instead, they purchase rights to purchase future production from mining companies. It de-risks mining, smooths out capital requirements for large developmental projects, and, if done correctly, can lock in favorable prices for streamers for long periods of time. The business model is inherently less risky and much higher margin than mining. That said, I certainly don't have the gold bug and will probably never own a gold stock. Why not? 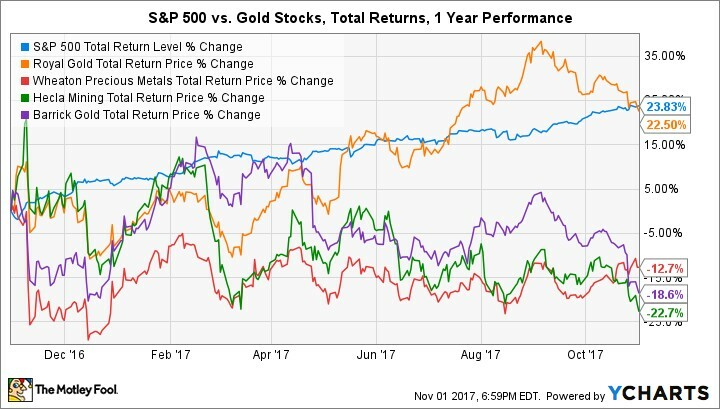 The reason is simple: Major gold stocks have an awful track record of keeping pace with the S&P 500. The point of investing is to use money earned today to grow wealth for tomorrow. You only have so much capital to deploy, which means every investment decision comes with an opportunity cost of potentially missing out on a better investment elsewhere. Gold stocks are rarely that sought after better investment. 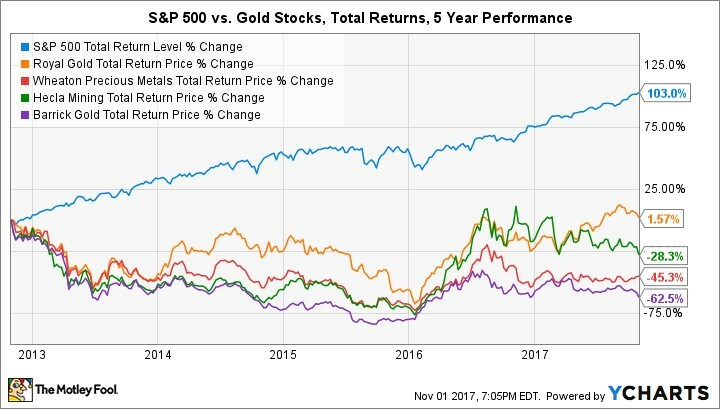 Consider that the one-year total returns (the actual returns, plus the dividends accrued) of the S&P 500 have beaten the total returns of Hecla Mining, Barrick Gold, Royal Gold, and Wheaton Precious Metals. Why do gold stocks struggle to match the modest returns of the broader index? Precious-metal prices tend to be volatile, which often leads to stock bursts in shorter periods that, unfortunately, fail to make up for the stock slides over longer stretches. But the preceding charts do show an important trend: Streaming and royalty companies have significantly outperformed their mining peers. 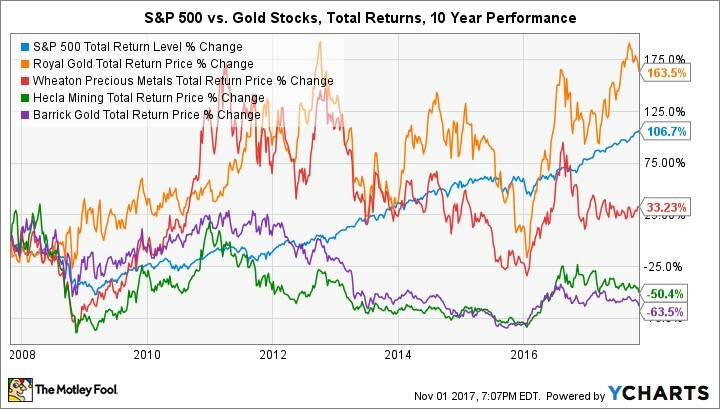 For instance, Royal Gold and Franco Nevada both outpaced the total returns of the S&P 500 in the last decade -- the latter coughed up total returns of 791%. Wheaton Precious Metals posted a return, but one far below that of the index. It's a bit odd at first glance. Despite generating more revenue, operating cash flow, and net income than its two streaming peers, Wheaton Precious Metals can't seem to get any love from Mr. Market. Can the stock capture some of the magic from Royal Gold and Franco Nevada going forward? Data sources: Company press releases, SEC filings. Wheaton Precious Metals is clearly much more reliant on silver than its more successful streaming peers. Indeed, it recently changed its name from Silver Wheaton, which hints at its core focus. But importantly, this silver-to-gold ratio has kept it from enjoying more of a boost from gold pricing trends in the recent past. That won't change anytime soon, and it suggests the stock may never catch the gains of Royal Gold or Franco Nevada -- or the S&P 500 for that matter. 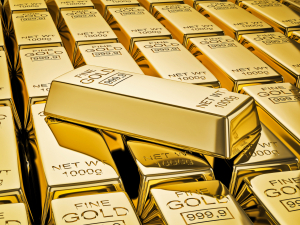 Generally speaking, gold stocks are not very good investments over long periods of time. 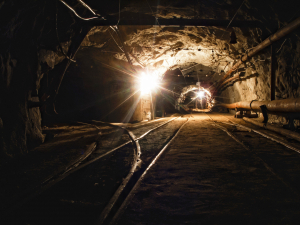 Although gold streaming stocks significantly outperform their gold mining peers, Wheaton Precious Metals does not have the right product mix to allow it to keep pace with its more gold-heavy peers. Therefore, most investors would be much better off simply buying an ETF or fund that tracks the S&P 500. 10 stocks we like better than Wheaton Precious Metals Corp.
David and Tom just revealed what they believe are the 10 best stocks for investors to buy right now... and Wheaton Precious Metals Corp. wasn't one of them! That's right -- they think these 10 stocks are even better buys. 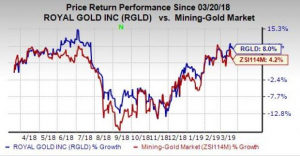 Why Is Royal Gold (RGLD) Up 2.3% Since Last Earnings Report?